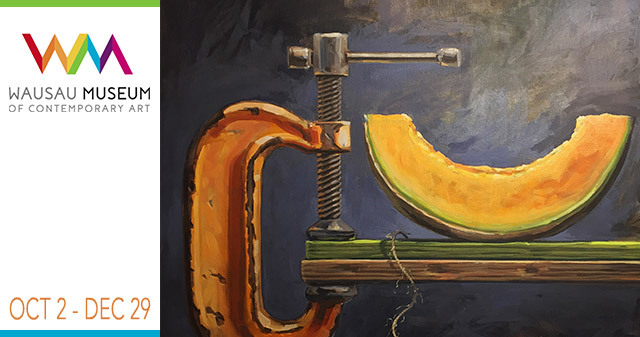 I’m thrilled to have “Melon Clamp” accepted to the Wausau Museum of Contemporary Art’s 2nd annual national juried exhibition. October 2nd – December 29th. This annual national juried exhibition is held at the Wausau Museum of Contemporary Art. This is an open themed show that attracts artists from across the country and will feature approximately 60 works. This year’s juror, Frank Bernarducci, a longtime 57th street art dealer and champion of realist painters, recently opened a 4,000 square foot ground floor space in Chelsea. Bernarducci Gallery exhibits contemporary realist painting, specializing in New Precisionism. Artists working in any and all styles from abstract to hyperrealism and everything in between were encouraged to enter. A special thanks to the jurist for selecting my painting “Melon Clamp” for inclusion in the 2nd ANJE. This year’s juror, Frank Bernarducci, a longtime 57th Street art dealer and champion of realist painters, has opened a 4,000 square foot ground floor space in Chelsea. Bernarducci Gallery continues to exhibit contemporary realist painting, specializing in New Precisionism. The Gallery represents many of the established painters with whom Bernarducci has had a long relationship, as well as the work of emerging artists. © 2019 Brian McClear. | All images are the property of Brian McClear and may not be reproduced without permission.